Crawley Town: Jensen, Young, Ward, Bradley, Youga, Tomlin, Wordsworth, Fowler, Simpson, Pogba, McLeod. Price, Dickson, Oyebanjo, Smith, Edwards, Morgan Harrold. 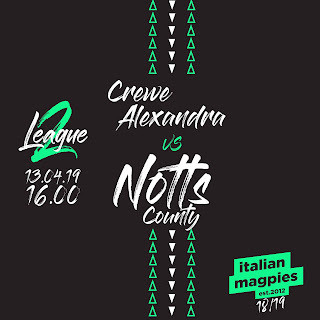 Notts County: Carroll, Dumbuya, Mullins, Williams, Adams, McCourt, Smith, Jones, Burke, G Thompson, Spencer. Sostituzioni: Pilkington, Hollis, Edwards, Wroe, Hayhurst, Bajner, C Thompson.